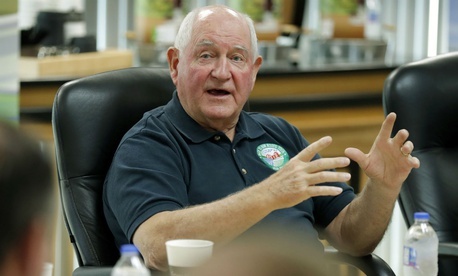 Agriculture Secretary Sonny Perdue late last week responded to lawmakers and outside critics of his proposal to move two Washington-based offices elsewhere in the country to place them closer to farming community stakeholders. In a Sept. 20 letter responding to queries from Sens. Pat Roberts, R-Kan., and Debbie Stabenow, D-Mich., leaders of the Agriculture, Nutrition and Forestry panel, Perdue justified the planned move affecting some 700 employees as a way to save on payroll and facilities costs while easing recruitment of job candidates who live nearer to land-grant universities. The controversial proposal announced in August, with a site solicitation period extended this month, would move by next summer the department’s Economic Research Service and its National Institute of Food and Agriculture, while also restoring the economic analysis unit to its previous slot inside the secretary’s Office of the Chief Economist. Critics said they feared the plan’s true purpose was to reduce the policy influence of the research units and encourage experienced statisticians to leave government. All of the existing departmental and White House directives on scientific integrity “will continue to be a priority,” he said. “As we consider new locations, all necessary steps will take place to maintain ERS' status as a Federal Statistical Agency. …Additionally, ERS will continue to be led by a career Senior Executive Service employee who will report to a career SES employee rather than the politically appointed Undersecretary” of Research, Education and Economics. Newsletter editor Jerry Hagstrom noted that Perdue may have been appealing to the senators’ home-state loyalties when the secretary mentioned that he enjoyed his recent visits to Kansas State and Michigan State universities. Opposition, however, continued from more than 100 groups. The American Statistical Association on Monday posted audio of a webinar it held last week examining the proposal that attracted 300 participants and included a sign-on letter for organizations that want to weigh in opposing the moves. The association’s executive director, Ron Wasserstein, faulted Perdue for not providing evidence that the move would solve recruitment challenges. “The USDA also claimed that the ERS should be closer to farmers, even though the primary audience for its research is other USDA program agencies and congressional and administration policy officials,” he said.